American Rail Transportation in Pictures, Sounds and Vide. Hello, and welcome when I started this page in 1998,its focus was on the Santa Fe Stockton Tower. As we all know the Santa Fe was subsequently merged into the Burlington Northern System. On January 12,1999 the Tower passed into history when it was closed by Burlington Northern. Since December of 2000 I had been living in Maine, and in October of 2005 made the decision to return to the West and am now living in Stockton, Calif. The focus on this page has also shifted to other areas of the country, in addition to Calif and Nevada. With the advances in Video Technology and the tremendous leaps in Computer CPU speed I have decided to start digitizing some of the video footage that I have shot over the last 5 years. The older photos will be left on line and eventually rescanned into higher resolution files. in Nebraska as I proudly served in the old "Strategic Air Command". 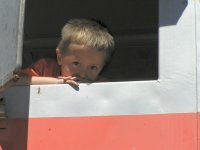 The picture at the right was taken at the Western Pacific Railroad Museum at Portola in mid August 2005, click on the picture to read the story behind what made this little fellows visit real special. This page is best viewed at a resolution of 1024 x 768 or greater. The pictures on this web site are Copyright 1998 - 2009 by John Manter or David Epling and may NOT be REPOSTED,ALTERED OR USED FOR COMMERCIAL PURPOSES. Permission is granted to download and use these images for your Personal Use only.